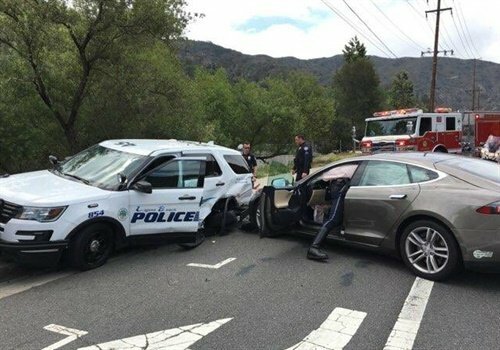 A Tesla sedan traveling in semi-autonomous Autopilot mode crashed into a parked police vehicle in Laguna Beach, CA, on Tuesday morning, authorities said. "Instead of driving in the roadway, it veered off," said Laguna Beach police Sgt. Jim Cota of the 11:07 a.m. crash. "Thankfully there was no officer in the car at the time." The driver of the 2015 Tesla Model S had minor injuries and refused medical treatment, reports the Orange County Register. It is still unclear why the Tesla sedan veered and struck the police SUV, which was totaled, Cota said. The crash remains under investigation.